Stretched bar LCD displays can be the ideal solution for industrial or signage applications where the space is limited and a conventional size display, with an aspect ratio of 4:3 or 16:9, will not fit. When an LCD panel is “resized” or cut down, the resolution and performance of the display are retained in the cut display. 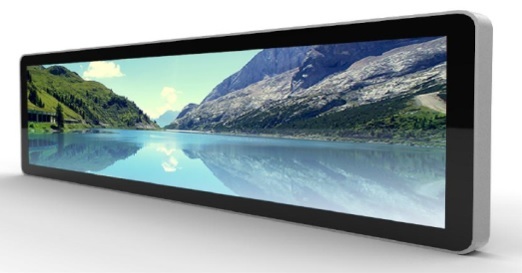 Our line of stretched bar LCD displays provide wide aspect ratios as wide as 32:9 and are cut to size to suit the particular dimensions required in a custom project. Larger ultra wide displays are ideal for displaying panoramic content and catching public's attention in advertising and digital signage applications, while smaller sizes are commonly used in appliances, kiosks, mobile devices, retail stores, and gaming machines. High brightness is native on many models, and is an option for most other models making these displays suitable for outdoor applications where sunlight readability is necessary. The most popular application for bar-style LCD is in public transportation displays, including route displays on-board trains, street cars, and buses, advertising displays in airports, bus stations, and train stations.